The ZTE V8 Mini Pro provides a quick upgrade to new software and features, with Android 7.0 Nougat onboard and a dual-lens camera that produces photos you can refocus. It has a budget-friendly Qualcommm chipset that makes it affordable if you're on a tight budget. The ZTE Blade V8 Mini offers one of the cheapest ways to upgrade to the latest version of Google's operating system and walk away with a dual-lens camera. 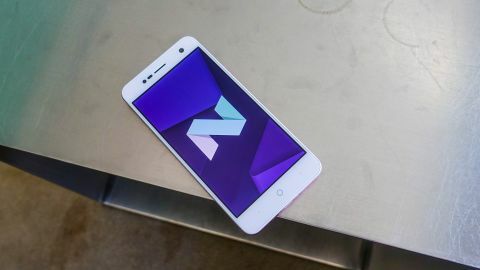 The ultra-affordable Android 7.0 Nougat smartphone that we tested at MWC 2017 is the lighter variant of the ZTE Blade V8 Pro revealed at CES 2017. It's interesting to see how quickly flagship features on the iPhone and Samsung devices features from a year ago can come to budget handsets. The ZTE Blade V8 Mini doesn't have the most powerful specs, of course, but it's got plenty for people who are casual phone owners who want a fancy camera. The ZTE Blade V8 Mini has a 5-inch HD screen, meaning it's at the lower 720p resolution. It's more powerful than the ZTE Blade V8 Lite, but it lacks in pixel count. That doesn't really show, because it looks just as good as the other Blade V8 phones that are Full HD at 1080p. The screen brightness only takes a minor hit. It has a one-hand friendly design at 143.5 x 70 x 8.9mm in a metallic body, which was surprising. It doesn't feel like a very cheap phone. There's a circular fingerprint sensor pad on back and mini USB port on the bottom, and yes you do get a headphone jack on this phone. There's a small camera bump for the dual lens camera, but that's fully worth it for better photos. We prefer quality pictures. The ZTE Blade V8 Mini's big highlight is the dual-lens camera that's made up of a 13MP and 2MP rear camera and combines into one photo. We tested out the bokeh-filled shots and were impressed with the lens blur on a cheap phone. In further testing, we'll see how it stacks up to the iPhone 7 Plus portrait mode. You can refocus photos in post, which is something the new iPhone can't do, and the Blade Mini camera supports 3D shooting to generate 3D photos. On the front, it has a 5MP camera, and there's plenty of Beauty Mode to go around. We'll have to test out both cameras outside of MWC 2017 before adding a review verdict. We already have a good idea about how the specs perform, with the Qualcomm 435 chipset, 2GB of RAM and 16GB of internal storage and a microSD card slot. It's not meant for serious gaming, but it's enough for most everything else. While the battery isn't removable, it does have a 2,800mAh capacity battery. What should help out is the fact that it runs Android 7.0 Nougat, which contains a bunch of battery-saving tricks like Doze Mode 2.0. If you're looking for a dual-lens camera phone and are on a serious enough budget that the ZTE Blade Pro seems unaffordable, then this phone is a very close substitute. It has the 13MP and 2MP camera for bokeh-filled shots that have a readjustable focus, and the metallic design is impressive. While we don't have the final ZTE Blade V8 Mini price and release date, it's supposed to initially come to Asia and Europe at a cheaper price than the ZTE Blade V8 Pro.